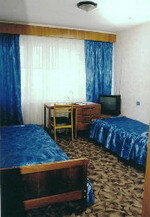 The Yunost Hotel is conviniently located for summer holidays in Odessa. Proximity of the Arcadia Beach, the most famous one in Odessa, picturesque sidewalk by the Botanical Gardens to the sea make this hotel a wonderful choice for those who seek for beautiful nature landscapes and at the same time wish to stay in Odessa. 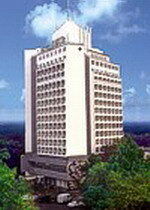 The hotel has recently renovated number of rooms and enhanced the quality of accommodation. Nicely furnished rooms are facing either Botanical Gardens or the sea. The hotel has cozy bar and two good conference halls. Hotel personnel is very hospitable and friendly though still does not speak English. However, they make it up in full with homely rooms atmosphere and very attractive room rates. Transfer from Odessa Airport to Hotel is available for additional payment. $30.00 - $45.00.